To translate this content, use google translate, or select the language. The city of Rio de Janeiro is looking different. It’s still beautiful, but different. At the final days before the Olympic Games, the city already changed her looks with the temporary structures built for the event and that will be dismantled after its conclusion. A huge provisory structure that deserves our attention is the Beach Volley Arena. 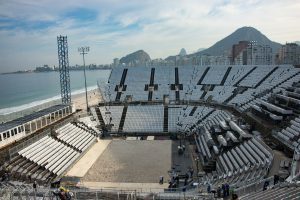 Located in the Copacabana Beach, a place with a very close relation with sports, the Arena has 8 volley courts, with one dedicated to the official matches (men’s and women’s), five for practice, and 2 for the athletes’ warmup, all made with sand and divided by a net. Beach volley is part of Rio de Janeiro’s day-to-day routine and is part of the Olympic Games since 1996. And this time it will have the magnificent Copacabana beach as its background. That and all other temporary structures will be part of the games, fulfilling the role for which they were made. The stage for several modalities, they help give an Olympic look to the city, and promise putting a show for the eyes in every competition. Don’t miss the Games! I agree to receive news and updates from Rohr.